Dr. Conway focuses on methods to directly measure forces across proteins and understand how these forces affect cellular function. 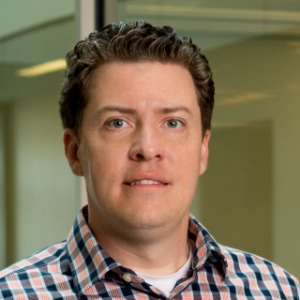 Daniel Conway, Ph.D., assistant professor in the Department of Biomedical Engineering, has received a National Science Foundation CAREER Award for 2017. This is the NSF’s most prestigious award given to junior faculty. It supports the early career-development activities of teacher-scholars who most effectively integrate research and education. 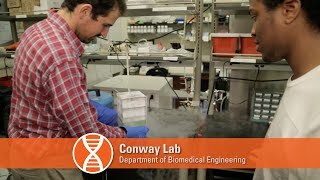 "Daniel E. Conway, Ph.D., assistant professor in the Department of Biomedical Engineering, has received a five-year, $1,829,564 grant from the National Institutes of Health for a research project to study the role of mechanical forces across proteins in epithelial cells. Epithelial cells separate the body from the outside environment and are the cells that provide a physical barrier in skin, lungs, and the intestines. 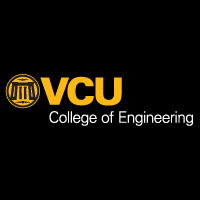 Conway will study how mechanical forces at both cell-cell junctions and the nucleus contribute to growth, wound repair, and barrier function in these cells..."
"Daniel Conway, Ph.D., is the recipient of a Virginia Commonwealth University Undergraduate Research Opportunities Program Faculty (UROP) Mentorship Award for his lasting impression on student research and scholarship. An assistant professor in the VCU School of Engineering Department of Biomedical Engineering, Conway was acknowledged for his dedication to student learning at the 7th Annual Poster Symposium for Undergraduate Research and Creativity on April 22..."
Mechanotransduction plays a key role in both normal physiology and in diseases such as cancer, atherosclerosis and hypertension. Nowhere is this more evident than in the vascular system, where fluid shear stress from blood flow plays a critical role in shaping the blood vessels and in determining their function and dysfunction. Responses to flow are mediated in part by a complex of proteins comprised of PECAM-1, VE-cadherin and VEGFR2 at endothelial cell-cell junctions; all proteins that clearly have other, non-mechanical functions. We review recent progress toward understanding the functions and mechanisms of mechanotransduction by this complex and suggest some principles that may apply more broadly. We examined the effects of fluid shear stress on metallothionein (MT) gene and protein expression and intracellular free zinc in mouse aorta and in human umbilical vein endothelial cells (HUVECs). Immunostaining of the endothelial surface of mouse aorta revealed increased expression of MT protein in the lesser curvature of the aorta relative to the descending thoracic aorta. HUVECs were exposed to high steady shear stress (15 dyn/cm2), low steady shear stress (1 dyn/cm2), or reversing shear stress (mean of 1 dyn/cm2, 1 Hz) for 24 h. Gene expression of three MT-1 isoforms, MT-2A, and zinc transporter-1 was upregulated by low steady shear stress and reversing shear stress. HUVECs exposed to 15 dyn/cm2 had increased levels of free zinc compared with cells under other shear stress regimes and static conditions. The increase in free zinc was partially blocked with an inhibitor of nitric oxide synthesis, suggesting a role for shear stress-induced endothelial nitric oxide synthase activity. Cells subjected to reversing shear stress in zinc-supplemented media (50 μM ZnSO4) had increased intracellular free zinc, reduced surface intercellular adhesion molecule-1 expression, and reduced monocyte adhesion compared with cells exposed to reversing shear stress in normal media. The sensitivity of intracellular free zinc to differences in shear stress suggests that intracellular zinc levels are important in the regulation of the endothelium and in the progression of vascular disease.